Last year, reports of exploding Samsung phones were rife. This year, it seems like this has now shifted to exploding cars instead – specifically, Honda Vezel ones. But while this isn’t particularly new news (the recall in Japan happened back in April last year), what Wall Street Journal reported yesterday was something that hit close to Singaporeans. According to the report, Uber had borrowed from Goldman Sachs Group and other banks to purchase more than 1,000 of these defective vehicles from parallel importers. 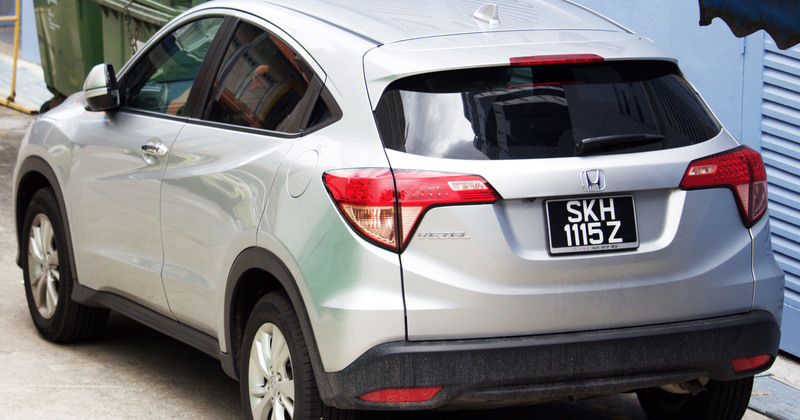 To add fuel to the fire (pun intended), it was alleged that Uber managers in Singapore were well-aware of the earlier recall of the Vezel model when they bought and leased them to drivers. In fact, an Uber-leased Vezel had actually caught fire in Singapore earlier this year. This happened in January, and fortunately, Mr Koh didn’t suffer any injuries from the incident. Regardless, the incident caused panic at Uber Technologies, and 3 days after the fire, Uber executives at its San Francisco HQ were briefed on a response plan which sees the company deactivating the faulty devices while waiting for replacement parts. However, the cars were still to be left on the road – picking up and dropping off passengers as usual. This is in spite of Uber’s Asia-Pacific general manager Michael Brown urging to take the vehicles off the road to avoid “unnecessary risk”. Uber Singapore’s general manager Warren Tseng, however, replied to Brown’s email by saying that the plan would “cost the company about S$1.4 million in driver wages, rental fees and parking costs”. “Asking drivers to give up their keys with no suggested fix will send panic alarm bells to the mass market,” he added. Chan Park, another Singapore manager, agreed with Tseng, saying that “leaving cars on the road ‘feels like low risk’, [and] the recall happened nine months ago”. However, Uber had reportedly asked its drivers to bring the cars to repair shop to fix the problem. Uber leases cars to their drivers via Lion City Rentals, created by the former in February 2015 to rent Uber-owned cars to partners. The rental model in Singapore is actually a first, as Uber tends to just rely on their partners’ private cars in other countries. This solution was created due to the initial lack of drivers in Singapore, given the high cost of buying a car here. However, as compared to buying vehicles from authorised Honda and Toyota dealers, Uber filled up their fleet with smaller importers, who apparently operate in a ‘grey market’ – “a legal channel outside manufacturers’ authorised networks – where safety, service and legal contracts are difficult to enforce”. The vehicles were also said to be 12% cheaper than those sold at authorised dealers. One of these dealers was Sunrita Pte Ltd., who had reportedly not fixed the cars sold to Uber as of the end of Aug last year, “citing a shortage of replacement parts”, to which Uber sent periodic emails for them to speed up the process. In January, Uber’s defective Vezels were still rented out to drivers, emails show. The email invitation joked that transportation for the meal “might be in a Vezel”. On the week of the dinner, an Uber manager reported that “more than 65% of the defective Vezels still hadn’t had the faulty parts replaced”. All the Vezels have reportedly been fixed now. In response to all of this this, Uber told WSJ that Singapore managers “sought to add new safety measures”, and “took swift action to fix the problem, in close coordination with Singapore’s Land Transport Authority (LTA) as well as technical experts”. Should The Rest Of Us Be Worried? For owners of Vezels, it would probably be best to send your car to a workshop to get it checked. A quick search online still shows that Vezels are on sale, so if you’re looking to buy one, do remember to check (and check again) that the defect has already been fixed. As for Uber-riders, if the statement from Uber is right, there’s probably nothing to be worried about, but you might want to avoid rides on these vehicles for now – just to be safe. But as far as consumers’ trust is concerned, Uber, and perhaps, LTA, definitely has a lot to answer for after this.